As I get older, I am not too fond of birthdays. But, I am fond of birthday cake. 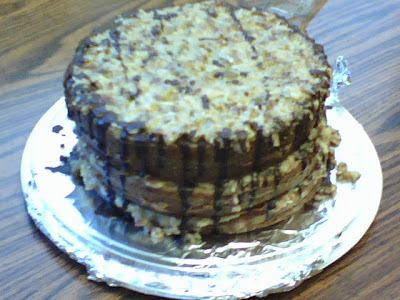 My friend, Mei, made this beautiful german chocolate cake for me. Briana sent this video to me during the day of my favorite little boy sing "Happy Birthday" to his Tagi (that would be me). In the evening, I went to their place for another fabulous german chocolate cake. Now, Briana grilled me a little on whether or not I knew I was going to get TWO german chocolate cakes for my birthday. Mei told me last week she was making me one. I told her she didn't have to, but I was secretly hoping she would. I liked having the cake at work. It was a wonderful cake and it was GONE before you knew it. But, that didn't concern me too much. I was happy to share. Because I knew I was having another one later in the evening. TWO cakes for the price of ONE birthday! And, with the one Briana made for me, I have leftover cake for the next few days! As you can see, Addie was a little bored with the whole thing since she couldn't have any cake. Aww....just seeing Addie is a birthday gift in itself. She's soooo adorable!! BTW...where's your facebook page?